Madhav Kumar became prime minister of Nepal after Pushpa Kamal Dahal quit last year. Kathmandu, Nepal (CNN) -- Facing political pressure, Madhav Kumar Nepal announced Wednesday that he is resigning as Nepal's prime minister. In a 20-minute televised address, Nepal said he wanted to avert crisis and find "political resolution to the peace process and the drafting of the new constitution." "Since it is not right to keep the country in a state of indecision and uncertainty, despite having a clear majority in parliament, I have decided to resign today so that the peace process and the constitution drafting process are completed," he said. Nepal has endured a fractious political transition since it was declared a republic in 2008 after the abolition of a centuries-old monarchy. This is the third government that has fallen since then. The opposition Maoists, who form the largest party in parliament, have demanded Nepal's resignation as the troubled Himalayan nation prepares a new constitution. Otherwise, the Maoists had threatened to disrupt the parliamentary session and block approval of the annual budget. The failure to adopt a new constitution by the late May deadline would have automatically dissolved the government. But the Maoists agreed to let the government amend the constitution and extend the deadline by a year. In exchange, the Maoists wanted the prime minister to step down so they could lead the government again. The Maoists fought a decade-long insurgency in an effort to topple Nepal's monarchy, leaving more than 13,000 people dead. They signed a peace deal in 2006. Elections in April 2008 made Nepal a republic and dethroned the king. The Maoists were the largest party in the previous coalition government, but their leader, Pushpa Kamal Dahal -- commonly known as Prachanda -- resigned as prime minister a year ago because the president overturned his decision to fire a senrio military official. The Maoists declined to join the next coalition government under Nepal's leadership, upset that the government was not making moves to integrate about 19,000 former rebels into the Nepalese army. The government has been reluctant to integrate its former enemies. 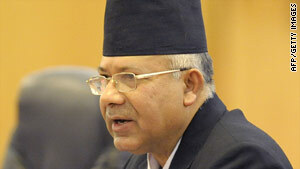 It's unclear who will succeed Nepal as the next prime minister.